You gotta eat. And if you're a rabbit in Carrotia, you eat carrots (of course!). Unfortunately, carrot stocks are low. So you've gotta head out into the woods to gather more. But there are birds swirling over head, looking to pounce on an unsuspecting bunny. You must head out and collect the carrots, then get back to town as quickly and carefully as possible. 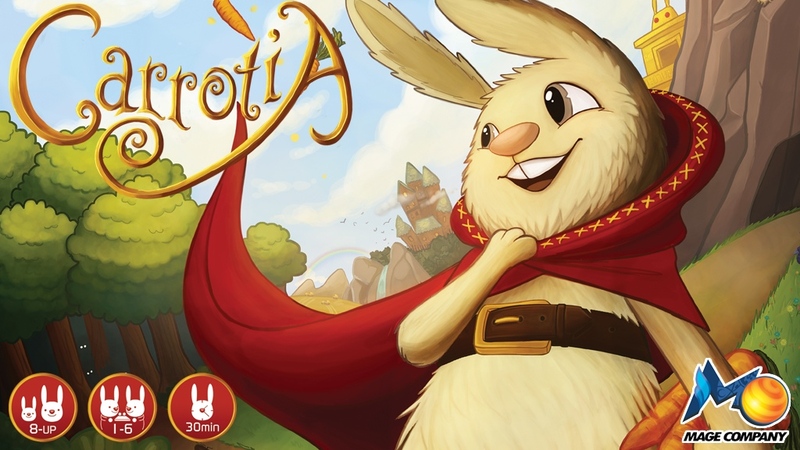 That's the story behind Carrotia, the new board game by Mage Company, up on Kickstarter. The game is a tile-laying game for 1-6 players. The object of the game is to get the Master Rabbit from one side of the board to the other in a certain number of moves. Along the way, you'll want to collect as many carrots as possible. However, overhead there are owls, hawks, and other birds of prey you'll have to avoid. But Master Rabbit is not alone, as support rabbits will be able to come in and offer special abilities in order to make it to the other side. Through three ever-increasing mazes, the players will have to guide their bunnies to the finish line. The Kickstarter campaign is up and running now. This is a quick one, only set to go for another 18 days.